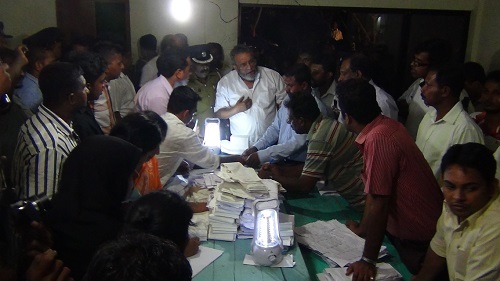 Pandemonium reigned in Puttalam town today after used ballot papers were found in a school hall at St Andrew’s MV which was used as a polling booth in last Saturday’s Provincial council elections, officials said. Three bags containing ballot papers were found in the school. The police and election officials who arrived at the scene carried out an inspection and took away the ballot papers to carryout further investigations. Election officials said they were checking whether the bags contained ballot papers which had been counted, but not taken away to the stores. However the public which gathered in the area expressed doubts about the counting process, claiming that the votes had not been taken into account. The Commissioner of Elections Mahinda Deshapriya rushed to the scene from Colombo to investigate into the incident. He assured the people that necessary action will be taken to investigat the matter. One of the UPFA candidates, Ashoka Wadigamangawa who had been elected to the council, but came last among the elected members arrived at the scene and lodged a strong protest. He accused the District Returning officer Kingsly Fernando for manuplating preferential votes.